When I started talking about getting a dog, my departed Lettie, I got lectures from everyone. "You have Birds, they will never mix." "If you don't watch over them every moment, it will go badly." "That dog will eat your bird." Lettie lived with us for 10 plus years. Oscar has been with me since 1986, and is still here. 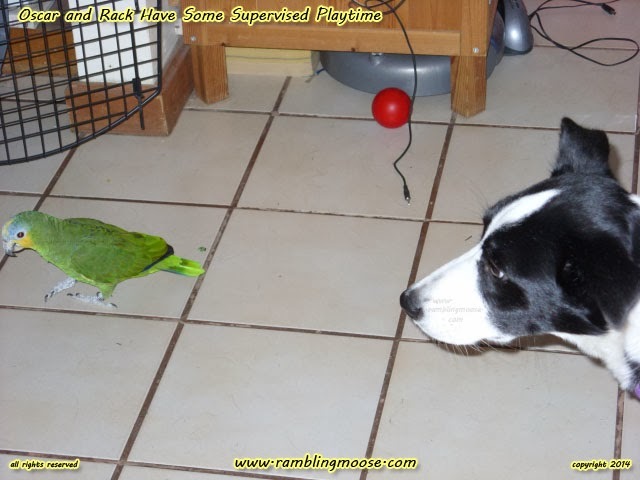 It can be done, but it means you have to watch over them and introduce the dog to the bird and vice versa. You also have to do it carefully. Lettie was more... assertive. She was an alpha dog through and through. She didn't care for the birds, and I did have a flock for a while, so I had to be especially careful. For the most part she was more protective over us than anything else. She didn't understand the birds or why they were there. They were more of a curiosity than anything else. Being Prey Animals, my parrot Oscar and my cockatoo Bert did not appreciate the attention. Lettie would get too close and there'd be a squawk and flapping of wings. The end result was a startled dog and a bird flying to the top of the cage. After a while they decided that distance was their friend. Lettie would park as close to me as she could but she kept a healthy distance from the cages. When Lettie left, she left a hole in my heart that you could drive a herding dog through. We got Rack two weeks later. Now, both dogs have something in common. They're both fearful dogs. Lettie was a fearful alpha who did not like other dogs. Rack is afraid of people and noises. I understand fearful dogs and that it will take time to get them to calm down and reclaim their sense of confidence. Everything that is a fear trigger can be conquered or at least minimized. It took about a year with Lettie, it is taking about a year with Rack. Someone once said that if you can't train a McNab Dog, you can't train a dog. Very true, but a fearful dog takes an extremely patient approach and a very gentle hand. I am absolutely convinced that a dog can have PTSD, Post Traumatic Stress Disorder. We most likely caused it, we must help to fix it. When I brought Rack into the house the first time, he looked around, sniffed the air and dove into his crate. He still hides but that is more from shutting off the world to get a rest from all those triggers around him. Being an incredibly intelligent breed, he's also incredibly curious. Dogs will use their noses as much if not more than their eyes in some cases, and he knows when something has been changed. He also knows when the parrot is on the cage instead of being in the cage and tends to give the cage a little extra distance. But there's a problem with all that. If you don't make the fearful dog take the step to conquer their fears, no matter how minor the fear or gently it is done, that step most likely will not be taken by the dog. It's up to you as the pack leader in your house to confront those fears. Some external "force" has to nudge them off the plateau, and it is up to you to do so. When I take Oscar out of his cage, there's usually some noises and flapping about that happens. Part of having a parrot, you never have a silent house. This drew attention from my Rack. My own lightbulb lit. Why not try a little bit of training with the animals. Supervised playtime. If I let Oscar on the floor, he will wander around putting things in his beak and basically being curious - and annoying. I'll let that go until he decides to try to turn the furniture into toothpicks, then gather him up for the short hop home. This time, I did it with Rack alert and in the room. I held Oscar down at snout level and he got sniffed by the dog. Then I set Oscar on the floor. Rack initially wandered "over there" away from Oscar but his curiosity got the better of him. Here was The Other in the house. Since Rack has a very gentle soul and a very submissive attitude, my showing him Oscar meant to him that he didn't have to run away from this "thing" in green feathers. Oscar didn't care, he walked over to the crate and enjoyed his Out Time. Rack did keep a respectful distance. He'd get closer then look back at me for approval. "Ok, Rack!" as he took a paw step closer. That really was about it. Rack eventually got close enough to Oscar and sniffed near him, then backed off. He tried it a second time and Oscar had enough. Rack looked at the bird, then me. It was as if to say "Did I do THAT?". Yep, you sure did. No big deal, we'll do it again. The whole episode took less than five minutes. We will repeat the behavior. I've seen pictures of little birds and huge dogs and I want that for my house. I'm stubborn but not stupid, if it ever gets safe for unsupervised play, it certainly isn't yet. But it may become so. It's all about patience and small steps. But I think that Oscar will have more freedom as long as he keeps away from the Sea-grass basket in my end table.